The last thing anyone riding a motorcycle wants to experience is being in a collision. We hear about the dangers of riding all too often and for good reason. Compared with people driving cars, motorcycle riders face a much higher risk of severe injury or worse. Most of us that ride is well aware of that fact and take safety quite seriously. 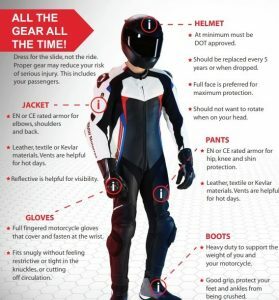 Besides ensuring ATGATT (all the gear, all the time), a proper fitting approved helmet, and common sense, any rider will tell you that skill is a key when on the road. We don’t have a steel cage and four wheels to offer us balance and security, and we like it that way. The sense of freedom is what makes riding a motorcycle so appealing. Motorcyclists face dangers out of their control each time we throw our leg over that seat— and we accept that risk every time we mount our bikes. The Alberta Motorcycle Safety Society (AMSS) focuses on safety, education, and awareness for all those in Alberta who are motorcycle riders. Our board are riders just like you and we understand the level of protection that needs to go into our sport. We continually look at educational tools, messaging, and products that will enhance our safety. 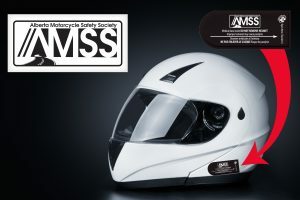 AMSS introduced the Medical Data Carrier (MDC) at both the Calgary and Edmonton Motorcycle shows in early January. 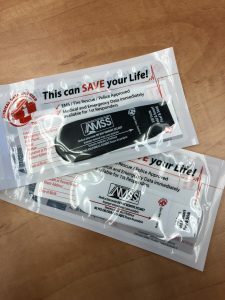 These highly visible, secure and aerodynamic pouches provide critical lifesaving data about the wearer, and crucial emergency contact information in the event of an emergency. On the outside of the carrier, the bold text warns a first responder not to remove the helmet as we should leave that to a professional to avoid causing potential paralysis. The carrier is to be attached to the left side of the helmet and is safe for all helmet surfaces. AMSS is pleased to have the Alberta Association Chiefs of Police endorse the MDC initiative across the entire province. 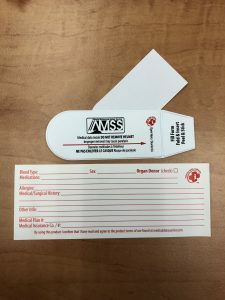 Inside the medical information system is a two-sided, waterproof paper containing information on the wearer’s identity and medical history. This includes information such as allergies, medications, blood type and pre-existing medical conditions. The MDC provides immediate and vital medical information that could potential saves valuable time. It is a small, simple, aerodynamic sticker holds vital information at the most crucial time. Endorsed by the Executive Director of The Paramedic Chiefs of Canada, Canada Safety Council, President of the Paramedic Association of Canada, and many others, the MDC is a useful safety tool that adds to a rider’s safety. The AMSS is proud to be the exclusive organization in Alberta to offer the MDC. You can get yours by clicking here.